No matter which country I go, there seems to always be animosity between two opposing political parties: Democrats vs Republicans (USA), Chinese Nationalist Party (KMT) vs Democratic Progressive Party (DPP). In the United States, talking politics is usually frowned upon in workplaces in order to prevent disputes amongst colleagues. Election night is a six hour long blockbuster movie, firing bullets at each other, hitting vital organs, making each blow count. However, in Taiwan? It is a playground fight, flinging mud at each other, each hit only to smear the others’ name, nothing proving their own self worth. Example of this? The upcoming election in November features the fight for Mayor of Taipei, the capital of Taiwan. In the spotlight is Sean Lien (連勝文), candidate from KMT. 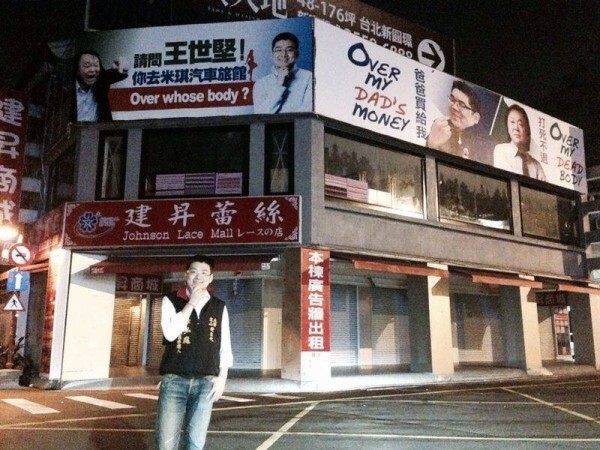 Last week, a bulletin ad was put up by DPP Council member Wang Shi-Jian (王世堅) mocking Sean’s legacy mentality. Using his own personal catchphrase “Over my dead body” and “Never giving up”(打死不退), Wang prepared catchphrases for Sean “over my dad’s money” “daddy will buy it for me”. Sean Lien is known as the son of Lien Chan, former Vice President of Taiwan and Honorary Chairman of the KMT. 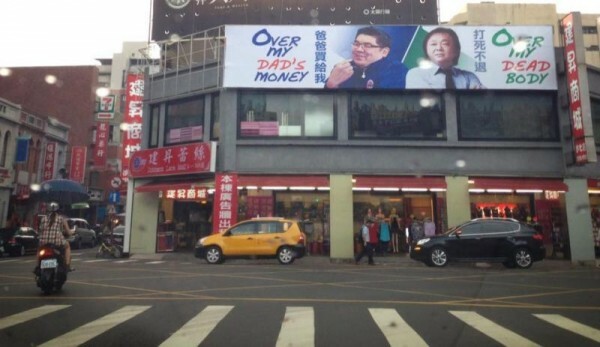 Following up this act, Sean’s former assistant and candidate for Taipei Congressman Hsu Hong-Ting (徐弘庭) posted a comeback ad with words “Going to Michelin Motel. Over Whose Body?” This referred to Wang’s incident of bringing his female secretary to a motel. I look at these acts and can’t help but see two kids having a playground fight, jeering at each other. Rather than pointing out family backgrounds, previous scandals, why not focus on improving one’s own self worth. Having a rich father could be easily trumped by policy to increase Taiwan’s economy. Scandals could be easily overshadowed by contributions to promoting Taiwan history and culture.